I am so glad that Jesus came to this earth to die for our sins. We’d be on our way to hell if He had not made the sacrifice to lower Himself to our level and take our punishment. I have heard it said it’s like a human being being willing to become an ant and live in an ant colony. That’s incredible. I know that I couldn’t imagine doing becoming an ant and dying for any one of them. I have a strong dislike for insects. But Jesus became one of us, experienced all the types of temptation that we would experience, and allowed Himself to be beaten and murdered, all for love. In the song Mary Did You Know? when Mary kissed Jesus, the song asks did she know “she had kissed the face of God?” I received a Christmas card with a reproduction of a painting where a Jewish woman who represents Mary is kissing the face of baby Jesus. When I saw the picture, it moved me. It made me realize When our Savior came to earth, He was a helpless baby. He had to have his diaper changed. He had to to be nursed. He had to be held and cuddled. He bonded with Mary, His mother. Mary and Joseph had to meet His every need. The fascinating thing is that He allowed Himself to be put in that position so that He could identify with us. He knows what it’s like to be a helpless human being, and He empathizes with us. I thank God that when I come to Jesus with my concerns, that He can identify with my struggles, whether it be facing rejection and persecution, not being understood by others, or simply being in a position of helplessness. In my Christmas poem below entitled, “She Kissed the Face of God,” I relay my thoughts about how Jesus must have felt as a helpless little babe. I hope that it will bless you and serve as a reminder to keep Christ at the center of your Christmas. May you and your family have a wonderful Christmas Holiday and a Happy New Year! God assigned them to meet His needs. In the future, her life He would save. He was still the King of kings. And she kissed His sweet little face. And He relished her warm embrace. But trouble would surely come. On a cross for mankind’s sake. His Name is above every name. To save us from sin and shame. After all, it is His birthday. 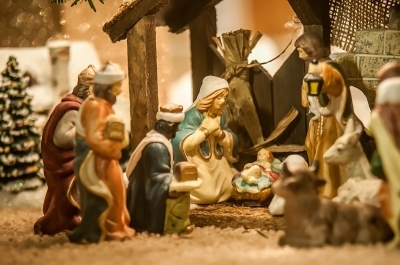 What Christmas traditions do you practice to help you to keep Christ in the center of your Christmas holiday? Leave a reply below. In John 15:1-2, Jesus said, “I am the true vine, and my Father is the gardener. He cuts off every branch in me that bears no fruit, while every branch that does bear fruit he prunes so that it will be even more fruitful.” Lord knows, I don’t ever want to be a branch that is cut off from God. “Cut off” implies permanent separation. That means He has nothing more to do with a person. I don’t know about you, but I can’t make it without Him. Unfortunately, He also said that the branches that bear fruit will be pruned. I pondered on that, and doesn’t it seem unfair to think that when we are being fruitful, we get cut anyway? “Cuts” can come in the form of people the enemy uses to thwart us, hurt us with their words, or circumstances that set us back. That is never fun. 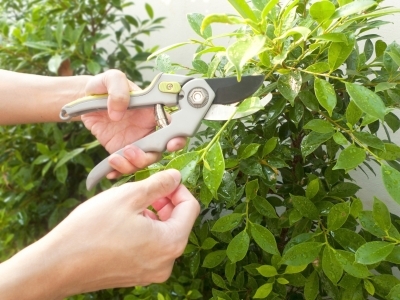 The definition of pruning is the process of cutting off dead or living parts or branches of a plant to improve shape or growth. A setback should be received as a “cut back” or a pruning that God does so that you can ultimately excel at accomplishing His will. A setback is to be seen as something that God will use to mature you and cause you to bear more fruit. They are his “pruning shears” in our lives. We must view them properly because if we don’t, discouragement will set in. When discouragement sets in, our spiritual and personal growth is hindered. Trust Him. When something happens that causes you to go backwards in progress instead of forward, it’s time to trust God. Trust that He has a plan. Trust that He’ll make the way. Trust that He will make it work for good (Romans 8:28). Trust that it’s not over until He says it’s over. When you trust Him, it allows you to go with the flow, maintain your peace so that you can hear His instructions clearly and get the maximum benefit out of the situation at hand. Pray and Expect to See His Power. When you get in a situation where you have been pruned by a setback, you have no control, and you need a miracle, it’s time to pray. That’s when you will really see God at his best. When His power comes to bear on your situation, that’s when the invisible God becomes visible. He manifests His power for the purpose of letting us know He is Who He is, what He can do, He really does exist and He is masterfully in control. Look for the Lesson. Setbacks are major opportunities for learning lessons. When you look for them and apply them to your life, that’s when growth takes place. You are changed. You receive wisdom and insight that no one can take away from you. In the process you learn about yourself and the ways of God you probably could not learn in any other manner. If you have experienced a setback or a divine pruning, when you trust God, expect His power to show up and look for the lessons that you are to learn in any given situation, it’s guaranteed that you will grow. Rejoice in that, if nothing else. You see, that’s the goal of pruning, to stimulate more growth. God wants to take you to a new level in your spiritual walk. Know that no matter what setback comes your way, God will make sure the benefits outweigh the drawbacks of the setback. The momentary light affliction will definitely work a far more eternal weight of glory (I Corinthians 4:17). You have God’s Word on it. Looking back on your life, how has pruning benefitted you in the past? Leave a comment below.